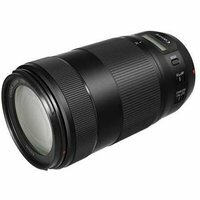 Ideal for sports and wildlife photography, the Canon EF 70-300mm f/4-5.6 IS II USM is a high-quality telephoto lens designed to let you get closer to the action. It features a Nano USM system for fast autofocusing, and a built-in Lens Information Display. Guaranteed to deliver superb image quality, its advanced optical system produces high-contrast, low-distortion images. Canon ET-74B lens hood not included.